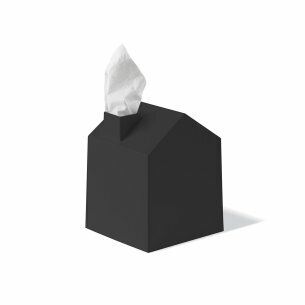 The Casa tissue box cover by Umbra cleverly disguises the less-than-attractive paper boxes of most facial tissues. Constructed of easy-to-clean molded plastic in a range of hip colors, the house-shaped cover dispenses each tissue through its "chimney," like a whimsical puff of smoke. Casa measures 6-3/4 by 5 by 5-inch and fits standard boutique (cube-shaped) tissue boxes. Designed by Mauricio Affonso for Umbra - original, modern, casual, functional and affordable design for the home.